Dancing Bear, tell me about your greatest accomplishment in your writing. Humility. I struggled with my self-righteousness and urge to think I knew something more or better than everyone else. I'd like to talk about some of your poems. "Movie House" suggests a relationship between a child and mother. How much did your parents influence your early writing life? Actually it was my grandmother who encouraged me to write first. She always saw it in me. My mother has been a closet novelist for years and she also told me that I would write, however I think she always believed that I would be a novelist or a short story writer. Two, if not more, of your poems ("Island Myths", "What Language" are dedicated to Jade. Who is she, and is she also a poet? Ah. Now that's funny: you're the first person to ask me that. Jade is my wife and yes, she's a poet too. And yes, there are a lot more than two poems dedicated to her. You show an affinity for poems that express the relationship of the narrator to animals, nature and religion. What is your attraction to these themes? Religious voice or not, no two poems of yours have the same voice. Your earlier works have a wide range of satirical ("Jesus in America"), charming, serious ("Smokers"), cynical voices. Do you find yourself, in growing as a poet, writing more and more in one voice? I would say that this is sometimes true: I use a number of different voices but I think it really depends on what the poem requires. The poem comes to me with a certain voice. Though I definitely use the same voice more than once. In fact I'd have to say that I use a regular and familiar group of voices, but what comes out in a particular poem is an aspect of a particular voice. As I continue to grow, I think I find new voices. This keeps it interesting for me (and hopefully for readers). I've picked up some collected works of poets in which most of the poems are written with one voice. For me, that's a hard read. It does get old after a while. Those sorts of works I will end up dabbling into over the next year or so, reading three or four poems at a sitting. And at the end, I feel I could write a "Famous Poet's poem" or parody. Perhaps it's a poet's ego that makes them think that one voice is all that can be associated with them and I guess that is why I put more emphasis on the poem's life than the poet's life. I think each poem demands a voice, a form, a rhythm and a style that makes it complete. Often times I hear poets say that the poem wrote itself, that it came to them like an epiphany or a bolt of lightning, and these are the poems that tend to stand up, that seem quite different from the author's other works, even the poet sometimes says things like, "not my usual kind of poem." A lot of poets work with the one or two lines that come to them, but I think a poet can imprint his ego over such lines and then those one or two lines in the finished poem can seem to require further attention. Almost like you'd want to spend some time with them, and explore what else they could say. Must you be in a certain mood to write in a certain voice? No, I don't think so. It probably hurts the poem to be in a mood. I think a poem reflects an emotion, but I need to have a certain distance from that emotion to reflect it correctly. Otherwise, it's likely to come out more like a journal entry than a poem. Poetry is about so many things going on at the same time in the same space. It's about language, about how much we can convey with words, about the emotion, but also about studying what that emotion does to ourselves and others, it's about commonality, connection, expression, and making a point. Say I was angry, hurt and raw from a relationship, then if I wrote from that place, and tried writing my pain directly at the person I held responsible, then I would be writing a personal letter, which may but would probably not have value to someone else. I may not be writing directly to the person I held responsible, but I'm still venting my emotions and that's more likely to read like a journal entry. I don't think this makes particularly good poetry. You know that feeling you get when someone begins yelling at their partner in public. Same feeling I get reading it. When you write poetry is there any one so-called technique that works for you? I get a line or two that comes to me. Sometimes I know what the content of the poem will be -- other times, I just have words burning in me, seeking a release. In either case, I hold them in my head for as long as I can. I let them pool and become somewhat of a chant or a rhythm -- something I can build from. Finally the dam breaks, they are ready to be written down, the other lines flow out. Then I do the business of cleaning up after the flood. How has your writing evolved as you've grown as a poet? I think the most significant thing for me is that I've slowed down. I take my time and therefore I don't dash out five poems on the same subject, but one poem that stews on it. I also think that I spend more time with the images and the metaphors -- I explore them. What writers have directly or indirectly influenced you as a writer? I tend to be one who is more influenced by a poem rather than a poet. But when I was younger, I was an avid reader of Edgar Allan Poe. James Wright's poems in This Branch Will Not Break got me to consider poetry as the medium that I prefer to write through. Poems by Wright, Neruda, Garcia Lorca, Jack Gilbert, Plath and the plays of Shakespeare are wellsprings I return to. I am fortunate that I have the opportunity to workshop poems with C. J. Sage; she is a significant and vital influence on my work. Other recent inspirations are poems by: Robert Bly ("Ghazals"); the Nicaraguan poet Carlos Martinez Rivas; the Mexican poet Oscar Wong; Ralph Angel; and Roddy Lumsden from the UK. You mentioned in another interview that you are working on a manuscript-in-progress, titled "Gacela." How is that going? It's pretty much done. I wrote 56 Gacela poems. The manuscript is out there looking for a publisher who will connect with the work. The poems were my journey through Garcia Lorca's style of ghazals, in which I started with reading and understanding what he was doing with them. I also embraced the ghazals written by Bly, Sage, and Ali. I entered ten of the poems in the Poetry Society of America's Alice Fay Di Castagnoli Award (for unfinished manuscripts) and it was one of two finalists. they refuse to admit the shadows, the upcoming season. The bear spends time like the owl awaiting a mouse. and green invented not love, but strife. created not for men but for the returning of Her. of water, of twilit days, and flood our plains. Would that abundance spring one night of lovers? eagled in joy, but the desire of crocodiles. Our mother's breast endlessly cresting the banks. a quiet and clovered shore where nothing seasons. A desire that keeps him from some Promised Land. Have you thought of publishing poems from your chapbooks into a collection, a book of poems? Each manuscript has a life of its own. I currently have three book manuscripts, but none of them has all the poems of any given chapbook. For instance, I have a book manuscript, "Island Myths," which has about ten poems from "What Language," a poem from "Prospero in Therapy" and a few poems from "Gods of America." Those poems go together better with the larger body of the book in that they have a common thread of voice and subject. I also think that it's something of a let-down to fans who have bought the chapbooks, if I merely republished them in some kind of combined form. Even if I added a few new poems to the mix, I'd be asking them to pay book price for a few new poems. I don't think that's fair, particularly to those readers who have supported me the longest, including the publishers who are still selling the chapbooks. Plus, I look at any manuscript as sort of a mega-poem. So there are poems that just don't work with whatever the mega-poem is trying to say or explore. In the case of my first full-length collection, Billy Last Crow (Turning Point, 2004), that's a series, so it's complete unto itself. With the Gacelas, those poems are of a specialized nature -- I knew I would be writing a book after the first few gacelas. Although many journals feature poems by Native Americans, there are few active journals that are devoted strictly to writing by Native Americans. Do you feel poetry by Native Americans should be published all in one book? For me, good writing is good writing, regardless of the ethnic background. I did an interview with Robert Klein Engler where he said that he identifies himself as a poet who is gay, not a gay poet. Yet given that there are journals devoted to certain genres and races and communities, I was wondering what you thought about this. There is American Indian Culture and Research Journal from UCLA. There's also The Gentle Survivalist. And there are a host of magazines that devote a good percentage of their publishing to ethnic writers. I do not feel a Native American poetry or literary magazine is necessary. Probably because I care less about who the writer is than what the poem is. I know that magazines that are devoted to a particular race, gender, religion, ethnicity or politic of writer are started with the best intentions: to give that group of writers a venue and to get them into a community of like writers. But I also feel that emphasizing what the writer is creates a bias (and in some cases a margin) -- she's a Latino poet, he's a gay poet, she's a Cuban poet -- and that their work is not held up to the same critical scrutiny. For me, I am a writer who happens to have Native American heredity -- I am not a Native American who happens to be a writer. I also worry about writers who become successful because they are viewed as being an (insert-label-here) poet. That they feel they are required to write about their cultural experience to maintain that success. The majority of my subject matter is not Native American, but American. This is going to seem odd as my first collection of poems, Billy Last Crow, follows a Native American character's life. But as I pointed out, this is one of three completed manuscripts I currently have out. I have six chapbooks published and the majority of what I written is not Native American-centric. In your own work, what is your criterion of success? The answer to this is not an easy one. I don't feel a poem is successful until someone else writes or comes up to me and says, "that poem really did something to me." Even then, I may look at it and think there is more that I can do for the poem. Still, if I'm not careful, I could easily replace all of the original language and the underlying emotion and feeling of that language. When I was taking painting classes, one of my better teachers gave me a piece of advice that I still apply to my poems: "Sometimes you can kill a painting with brushstrokes by over-painting -- you have to know enough sometimes to just leave it alone and let it be." I'd like to talk about some of your other interest. Can you tell me about the DMQ Review? What sorts of works do you look for? When you chose to publish or reject something, what are the factors in making that decision? I'll start with the process: each poem is read first by the assistant editor and possibly other staff; each poem is given a vote of yes, no or maybe; after the voting, I read each poem, first for its content and if it has a point or makes some sort of sense; then if I am still interested in the poem, I read it for language, alliteration, rhythm, craft; if I have problems with the poem or come up with a different result from the rest of the staff, then I ask the staff to explain why they liked or disliked the poem. Sometimes they see things about the poem that I haven't seen that will change my mind. The DMQ Review seeks lyrical, imagistic, metaphorical work. We tend to like poems that have a point. Your radio show, "Out of Our Minds," airs poetry readings. How do you decide what poems will be read aloud? I'm assuming this is a different process than the selection of works for DMQ - that is, are the people who publish in DMQ invited to read on the radio? Or do you look for a different kind of poem, the sort of sound-poem that reaches its full potential when read out loud? How does the public respond to this show? I leave it open to the poet to present what poems best represent his/her work on "Out of Our Minds." I keep the format so that the author reads two or three poems, then we talk about poetry or a project the poet is working on or a specific poem. Then I have them read another couple of poems and back in forth between reading and conversation for the hour. I may ask a poet to read a specific poem, but that's probably because I really like that particular poem. The criteria for being on the show are different from the DMQ Review. For the DMQ Review, we're looking at the best individual poems submitted to us. For the show we look for authors whose work has been juried by editorial publishing processes. That is to say, they've had their work appear in a certain number of magazines, and we ask that the poet submit a press kit with a recent book or chapbook. These are not rules set in stone, but general guidelines. And I'll go one step further and add that Dream Horse Press has a separate and distinct process from DMQ or "Out of Our Minds": it is looking for individual poems that work well alone and together in a collection, be it a chapbook or a full-length book. The end result of these processes is: if you were to look at DMQ, you'd see individual poems that stand up on their own; if you read a book from Dream Horse Press, you are looking at a collection of strong, individual poems that work well together; and if you listen to the show you are listening to an author who has the ability to pass several editorial requirements. Some writers whose work appears in the DMQ Review have been asked to be a guest on the show, but that is because the writer has met the show's criteria. I think the public responds well to the show, the letters and feedback I get are positive. I also get a lot requests on author information, like what books they have out, that kind of stuff. Can your recommend a book -- poetry, fiction, etc -- to our readers that you've recently read? A single book? This is going to sound like blowing my own horn, but I really believe the best collection of poems I've read in the past year is the anthology, edited by C. J. sage, called And We The Creatures (Dream Horse Press, 2003). If I didn't believe that, I wouldn't have published the book. I'd also recommend the first issue of The National Poetry Review; it is packed with great poems. And I recently finished and enjoyed Lynne Knight's Book of Common Betrayals. in need of paint, not a workmen's verse. or at least, pay the landlord with a berceuse. numb teenagers in love and ready to consume. a man drops from a ledge like an old safe box. time to raise the guitar and play the sidewalk. her house, her place of song. my fingers follow the rhythm. a lullaby before this autumn sleep. J.P. 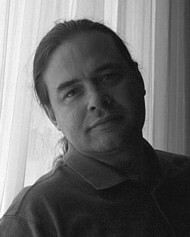 DANCING BEAR, twice-nominated for the Pushcart Prize, is the author of various chapbooks, including What Language, which won the 2002 Slipstream Poetry prize, and Blue Hand. His poems have appeared in the Seattle Review, Atlanta Review, Evansville Review, Midwest Quarterly, The National Poetry Review, Controlled Burn; New York Quarterly; Clay Palm Review, The Adirondack Review, Midwest Poetry Review, Slipstream, Nerve Cowboy, and Rio Grande Review, among others. He is the Editor-in-Chief of DMQ Review, the owner of Dream Horse Press, a publishing company, and the host of "Out of our Minds," a weekly poetry radio program. His first full-length collection, Billy Last Crow, will be published by Turning Point in 2004.